Cut by Kevin Gray and Steve Hoffman from the Original Analog Master Tapes! This Incredible Album From the '70s is Now Available on Two 180 Gram 45rpm LPs & Pressed at Pallas! A fine offering from one of England's oldest bands, this album mixes a generous blend of pop and rock that appeals to both sexes: Women like it because it is "listenable", men like it because most of the songs are borderline romantic without being mushy. With Rumours, Fleetwood Mac produced one of the most celebrated albums (and one of the best-selling albums) of all time. While Fleetwood Mac had finally attained their long-desired commercial success, the band was fraying apart behind the scenes. The McVies divorced in 1976, and the Buckingham and Nicks' romance ended shortly afterward. The internal tensions formed the basis for the songs on their best album, Rumours. Released in the spring of 1977, Rumours became a blockbuster success, topping the American and British charts and generating the Top Ten singles "Go Your Own Way," "Dreams," "Don't Stop," and "You Make Loving Fun." It would eventually sell over 17 million copies in the U.S. alone, making it the second biggest-selling album of all time. 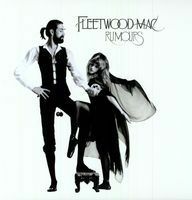 Rumours reads like a greatest hits package rather than an incredible record. This album is a “must have” release in every sense of the word. "The band's two romantic couples — bassist John and singer-keyboard player Christine McVie, who were married; guitarist Lindsey Buckingham and vocalist Stevie Nicks, who were not — broke up during the protracted sessions for Rumours. This lent a highly charged, confessional aura to such songs as Buckingham's "Go Your Own Way," Nicks' "Dreams," Christine's "Don't Stop" and the group-composed anthem to betrayal, "The Chain." The Mac's catchy exposes, produced with California-sunshine polish, touched a nerve; Rumours, a landmark Seventies pop album, ruled Billboard's album chart for thirty-one weeks." Cut by Kevin Gray and Steve Hoffman at AcousTech Mastering! • From the Original Analog Master Tapes! Special Deluxe Packaging includes: Special Matte/Gloss finish with 'Fleetwood Mac Rumours' in Embossed Lettering, Mick & Stevie in a glossy finish and the rest of the cover in a matte finish, Gatefold Jacket, Lyric Insert and Black & White Photos of the band in the inside Jacket! The best news? Warner Bros.’ pressing is flawless from beginning to end. This is definitely the super-sized version of Rumours: It goes beyond big sound. You can just feel this record breathe, in and out, while listening to tracks that you thought you knew like the back of your hand. Wait until you experience the new information that’s available. And the soundstage is massive. If the music doesn’t float well past your speakers’ boundaries, it’s time to go shopping for a new stereo. We've had and heard the test pressing of this Rumours reissue, as it was mastered at AcousTech way back in July 2006! In fact, we helped convince a top Warner Bros. executive to cut it at 45 RPM. We've been dying for this sucker to come out! We can say, unequivocally, that it is UN-FREAKIN'-BELIEVABLE! This will be one of the most exciting releases of the year, and the sound matches the hype. Buy this baby! This 45 RPM version is so good--that it literally shattered my long held belief that Rumours was a good sounding record. One wonders what a recording like Steely Dan's Aja would sound like, given similar treatment. This set is nothing short of demo quality--and I wish nothing more than it would be available to every audiophile.